The Grand Canyon Caverns, 230 feet below ground level, are the largest dry caverns in the United States. 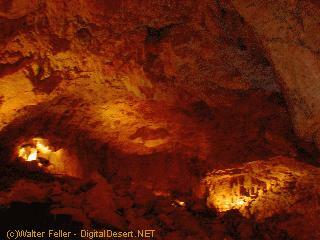 Dry caverns are rare, only 3% of all caverns in the world are dry. Being dry, stalagmites and stalactites are virtually non-existant. Air comes into the caverns from the Grand Canyon through 60 miles of limestone cracks, crevices and caves. The caverns are huge, and those with claustrophobic tendencies won't notice them as 3 football fields could fit comfortably inside. 345 million years ago (Mississippian Period), the southwestern U.S. was covered by an ocean. As small sea animals died over the millions of years, thier shells and skeletons created a mud rich in lime. This mud eventually hardened and changed into the limestone bedrock, which is what the caverns are within. Millions of years later the bedrock was pushed up, to over 5,000 feet above sea level. These upheaval events split the Earth's crust allowing water to flow into what is now the caverns. About 35 million years ago abundant rainfall carrying a mild acid solution poured into the caverns. This solution utimately seeped it's way through the cracks and crevices draining into the Colorado River. Millions of more years found evaporating water leaving calcium deposits to decorate the walls and floors of these beautiful formations. In 1927, Walter Peck was on his way to play poker. When walking along the trail he fell into a funnel-shaped hole. He noticed the hole went much deeper than he had fallen in and returned the next day with a few friends, rope and lanterns to explore the apparently deep hole he had stumbled into/upon. They lowered a man down into the hole and by the time he had touched bottom, 150 feet of rope had been let out. When they raised the first cavern explorer back up, the excitement intensified. He had noticed at the 50 foot level two human skeletons, and more importantly, sparkling rocks on the cave walls thought to be gold. 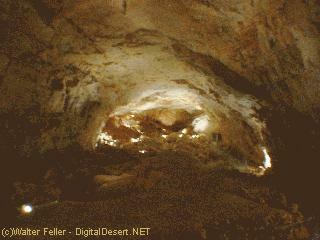 Walter brought the property named it the Yampai Caverns and started setting up for a gold mining operation. 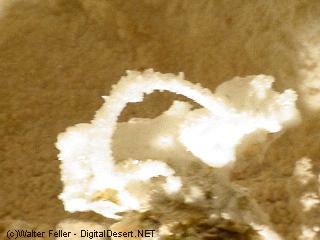 He was dissapointed that the "gold" had turned out to be calcite crystals glittering in the lantern light. So Walter decided that the cavern would make a fine tourist attraction. He started charging 25 cents per visitor to lower the into the hole, but they had to bring their own light. Since the opening was so narrow only those in the best shape could make the trip of a couple hundred feet down. Nine years later a wooden staircase was built and the caverns renamed Coccocino Caverns. In 1957 a swinging staircase was added for additional access. Also the caverns were again renamed to Dinosaur Caverns after the fossil remains of a prehistoric 15 foot tall sloth had been discovered. 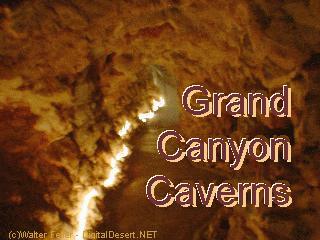 Finally in 1962 an elevator was installed and the cavern's name changed to Grand Canyon Caverns. The scratches of the sloth attempting escape can clearly be seen on the walls. A claw, on display upstairs shows the size of the trapped beast in relation to a normal modern sloth. The extra few steps up an optional, exceptionally steep part of the trail is worthwhile to take a peek at "Bob". "Bob", the mummified bobcat has been a local resident for between 100-150 years. The poor deceased animal appears confused and seems to be heading in at least two, maybe even three directions at once. A final note on the two human skeletons. At first they were reported as being from prehistoric man, and this initially brought scientists from all over to examine the remains. 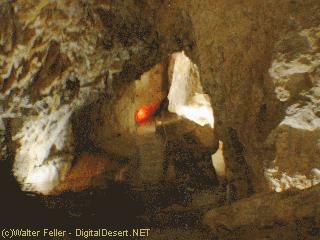 However, it seems that in 1917 two Hualapai Indians were buried by ceremoniously lowering their bodies into the hole.